Liz VanWormer also contributed to this piece. Living along the California coast sparks our interest in the connection between land and sea. As we walk along the beaches and surf the waves, we have the opportunity to appreciate the diverse organisms sharing these environments. Southern sea otters (Enhydra lutris nereis) are some of our most charismatic marine neighbors. They are also some of the most threatened. What can they tell us about our shared environment? Are we impacting their health with our use of coastal land? Are their problems important warning signs for the health of that ecosystem and perhaps our own health? Although once very broadly distributed along the Pacific coast from Japan and Russia to California, sea otters were hunted almost to the point of extinction for their luxurious fur coats in the 17-1800s. After a treaty banning sea otter hunting was signed into effect early in the 20th century, their populations began to recover. However, population growth in California didn’t reach expected levels and lagged compared growth in northern populations near Alaska. Even with the additional protection of the Marine Mammal Protection Act of 1972 and being listed as a threatened species under the Endangered Species Act in 1977, California sea otters have experienced periods of decline. In order to understand what might be affecting the recovery of California otters, a diverse group of scientists is studying otter ecology including reproduction, diet, home range and health. Good levels of reproduction in the otters and no evidence of otters dispersing (migrating?) out of California suggest that mortality might be a large contributor to the slow sea otter recovery. If that is the case, we need to know what is killing sea otters. Upon further investigation, scientists discovered that infectious disease plays a significant role in sea otter deaths. Unexpectedly, two landbased parasites, Toxoplasma gondii and Sarcocystis neurona, were responsible for causing fatal brain infections in 24% of sea otters found dead on the California coast from 1998-2001. Although these are just two of the many diseases and environmental factors that impact otters, they offer an important chance to investigate the connection between terrestrial and marine environments. The puzzle of how the parasites Sarcocystis neurona and Toxoplasma gondii, which are shed on land in the feces of opossums and cats, respectively, are infecting sea otters has led California scientists to establish large collaborative teams to understand the land to sea link. In the case of Toxoplasma, the extremely hardy infective parasite stage, called an oocyst, is deposited on land where it can survive for over a year. The sources can be people’s pet cats and stray cats, as well as any wild cats in the area like mountain lions and bobcats. The parasite can accumulate in the terrestrial landscape and serve as a source of infection to other domestic and wild animals, birds and humans. All of these species can become infected by ingesting oocysts or by consuming parasites in the raw meat from an infected animal. As sea otters don’t eat any animals known to harbor Toxoplasma, scientists think run-off from land carries the oocyts into the ocean where otters can then become exposed. Cat litter flushed down toilets may be a small contributor to otter infection if it is discharged into the ocean from water treatment plants. Currently, studies are underway to determine how many cats are shedding Toxoplasma, where the areas of greatest risk for Toxoplasma exposure on land and in the sea are located, what terrestrial wildlife species are exposed and how the parasite might be transported into the ocean. Hopefully, a better understanding of the parasite’s potential land to sea transmission will help to protect otter health, which has broader impacts on the marine environment. 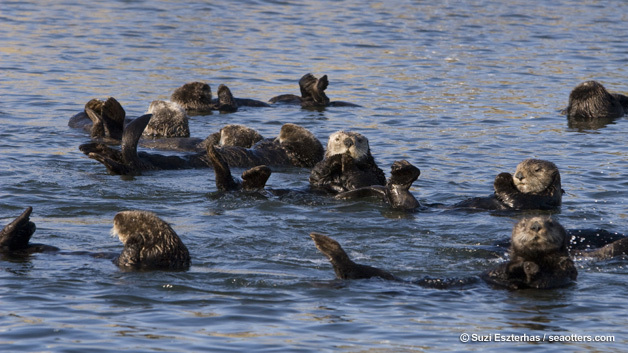 Otters serve a key role in maintaining healthy kelp forests along the California coast. By controlling sea urchin populations which feed upon the kelp, they help to protect habitat for many other species including fish, birds and other marine mammals. Because they spend their lives in the nearshore waters, sea otters also serve as an excellent sentinel for pathogens and pollutants entering the ocean from the terrestrial environment. Watching the otters sleep and feed in the coastal kelp beds, we might not realize how strong the link is between our health and theirs, but we share the waters where we swim and surf and a taste for certain seafood which have been shown to concentrate parasites, including Toxoplasma. Detecting Toxoplasma in the sea otters has increased awareness of the potential for human exposure to this pathogen, which can have severe impacts on people whose immune systems aren’t functioning well in addition to the developing fetuses of infected pregnant women. Although humans are typically exposed through eating undercooked meat, increases in sea otter exposure to Toxoplasma underscore our own risk of infection through ingesting oocysts from environmental sources. Seeing sea otters as sentinels helps us to realize the importance of what we contribute to the oceans. Human activities have the potential to increase disease transmission and the flow of pollutants into the marine environment, but with the otters’ help, we are building our understanding of nearshore ocean health. Working together, citizens and scientists can make the land to sea connection a positive one.